When I was pregnant, I would read weekly updates of ‘What your baby looks like this week’ generally it would be about the size ‘this week it’s the size of a kidney bean’ or the development of things like fingerprints, eyelids and eyelashes. But, I vividly remember being incredibly fascinated by the fact that Embryos have a tail for a period of time, but then it is reabsorbed by the body. I love stuff like this. So when my daughter started to develop a second row of teeth I was again fascinated. She is 6 and her teeth are wobbly but haven’t come out yet. The new ones have taken the least path of resistance and are coming up behind her baby teeth. Normally the new tooth pushes up on the baby tooth and dissolves the roots. It’s not the first time I’ve seen it, years ago when I was a waitress, because of the angle I was at standing over the table taking an order I did notice a child with an entire set of teeth behind the first. I’ve done a bit of reading and apparently Shark Teeth are quite common in kids, apparently it occurs in approximately 10% of kids. 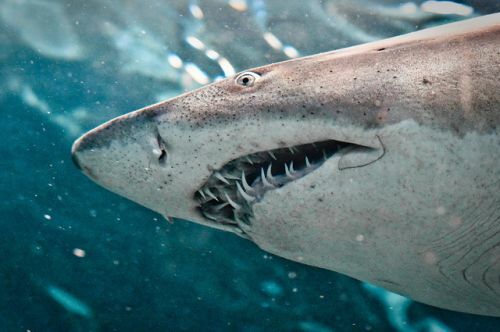 I’ve text a friend of mine who is a dentist and she didn’t know what I meant by Shark Teeth, apparently there is a medical term for it, but Shark Teeth will suffice. Hopefully, nature will take its course and the baby teeth will come out and the new ones move into place. I really don’t want to have to go down the route (excuse the pun) of having them removed or costly orthodontic bills when she gets older. Have you ever experienced this? Did it sort itself in the end? With Summer holiday looming I thought you may be interested in a few days out I discovered for kids recently near St Albans, Herts. These two places are perfect for letting kids burn off a bit of that energy. On the weekend we went to Mead Open Farm, it’s about 30 miles from St Albans, Herts near Leighton Buzzard. I’d heard good things about their Christmas Grottos in the past but have never made it. It was absolutely perfect for two nearly 7 year old girls. It’s your typical Farm, but was a great time to visit (early July) as there were loads of new babies. Upon entering the farm you are faced with a wonderfully new adventure playground. Luckily as the weather was nice we managed to avoid the soft play area, it is perfectly adequate but I have an irrational fear of the places. Even though the car park was fairly busy the site is big enough to swallow people up. There were absolutely no queues and plenty of places to sit and enjoy a coffee whilst the girls played. 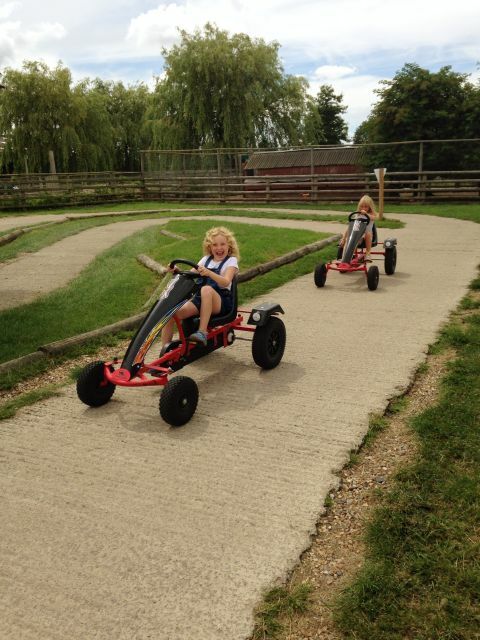 They absolutely loved the Go-Karts, I have to admit that I imagined they were motorized but was pleased they were not. Once the girls got them going, they zoomed around squealing with laughter. 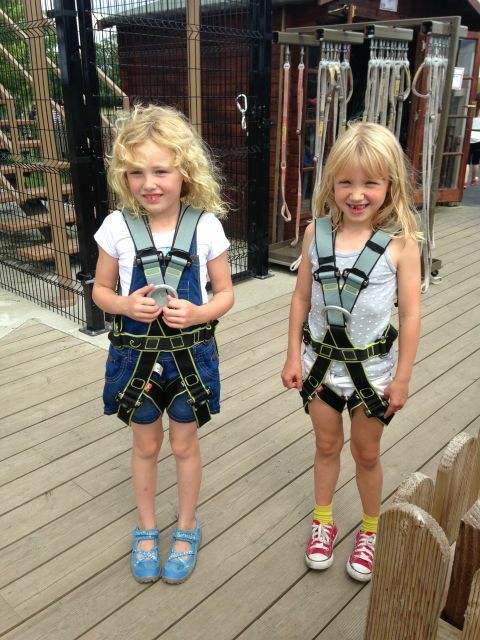 Within minutes they were rigged up in climbing harnesses and exploring the Sky Train. There was no time limit and they could stay on as long as they liked. At this point, I want to commend the young staff that work there, true professionals, if the children wobbled they joined in and helped them overcome their fear with gentle encouragement. 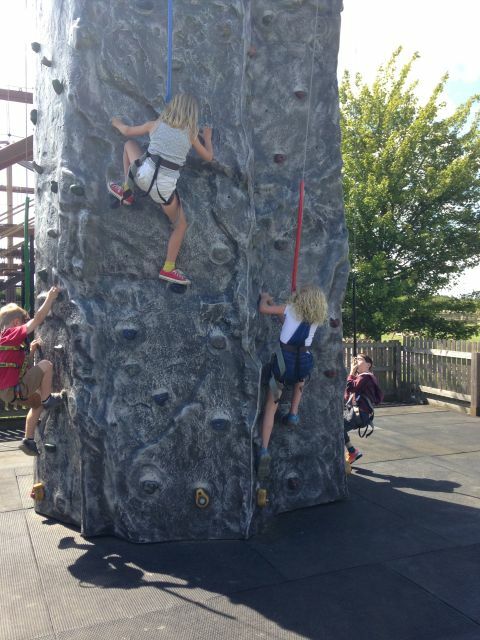 Similar happened on the climbing wall, my own daughter was struggling, so the attendant put a harness on and climbed alongside her encouraging her. She didn’t manage to make it to the top, but was pleased with her efforts. All in all a really good day out. If you decide to get a yearly membership they will deduct the cost of your day ticket, so it may be something worth looking into. 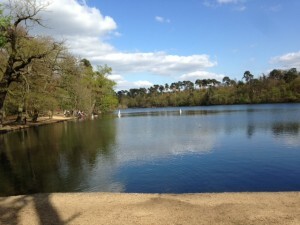 We’ve been to Black Park before and absolutely love it, it’s only about 30 minutes away from St Albans. 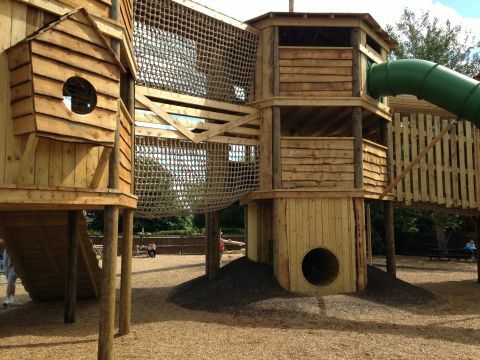 It’s a beautiful site with a lake you can walk around, a very impressive adventure playground, cafe, open spaces and recently they’ve added Go Ape Tree Top Junior. 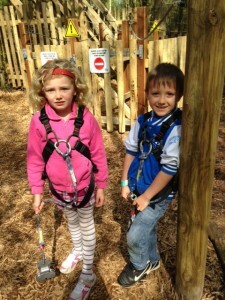 Kids can climb through the trees and zoom down the Zipwire. The sessions are one hour long and they can go around as many times as they like. It’s suitable for children 6+ years. What I really like about it is the children are connected to a safety rope the entire time they’re in the trees, so there is no chance of them falling. 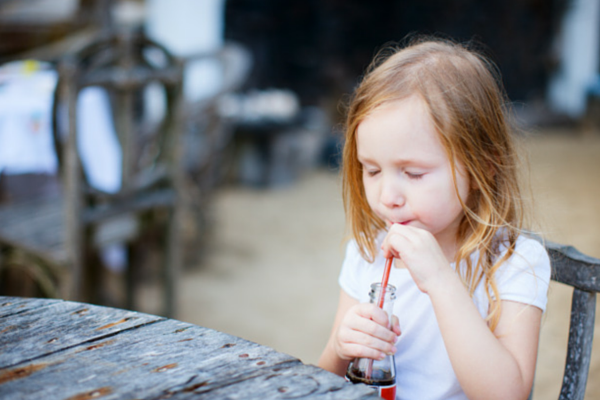 I really was tempted to have my daughter’s birthday party there this year, but the only thing that held me back was worrying if some of the younger children bottled it. I may wait till next year when they are a bit older. It’s £17 per child for parties and you can also hire the Forest Shelter and lay on your own picnic. It’s definitely on the list of future birthday venues. 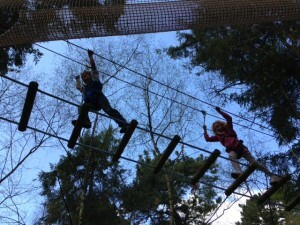 Even if you don’t fancy Go Ape, I would strongly encourage you to visit Black Park, take a picnic and enjoy the facilities. There are also cycle tracks. We’re off canoeing the week after next and will let you know how we get on. Seriously, how cool are these self-propelling scooters from Yvolutions? They come in two sizes 5+ and 7-adult and in a choice of colours starting from £69.99. It was incredibly easy to put together, simply unfold the scooter and assemble the handlebars, be careful not to pinch your fingers. I don’t know why but I thought you would use a pumping action with your legs (in and out motion) to get it going but in fact it’s more of a wiggle of the hip as you can see in the video. It also has a handbrake if you get going too fast. 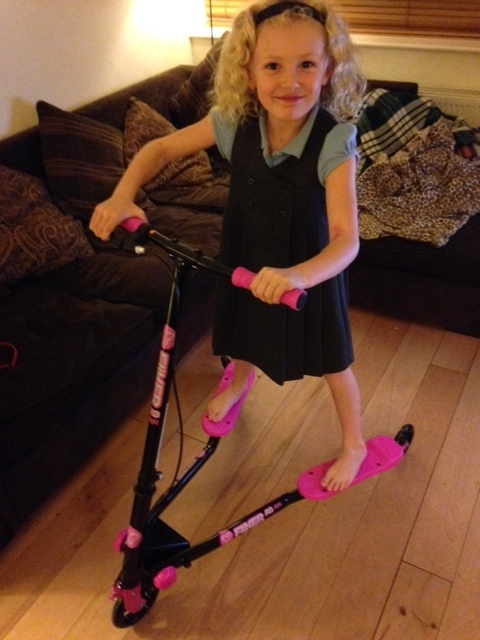 My daughter is only 6 and took to it very quickly, zooming around the house in minutes. The only challenge we have had is the journey to school is up hill, but makes it rather exciting on the way home. Plus, we have the perfect netball court in our local park to practice on, unfortunately, the idiots from the local council have replaced the tarmac paths with gravel, which makes it impossible to scoot on. Luckily there are other spaces around town we can use it. I think it would make a great Christmas gift for those who are starting to outgrow their regular scooters or are thrill seekers! 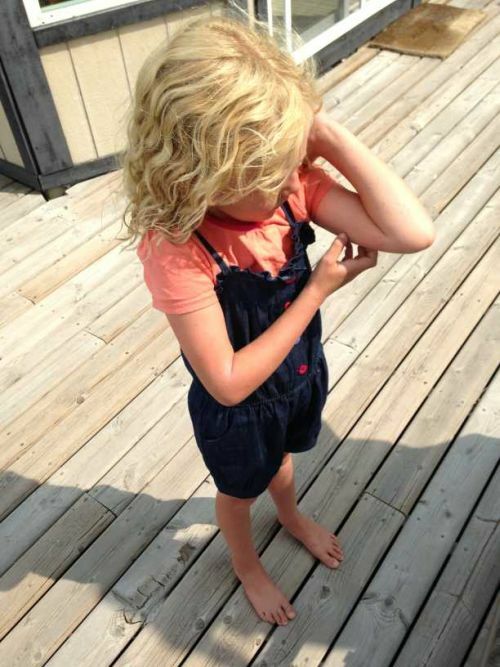 Growing up in Canada everyone knows what duck itch or swimmers itch is and you’d be hard-pressed to find someone who hasn’t had it. Once it flares up it resembles chicken pox. 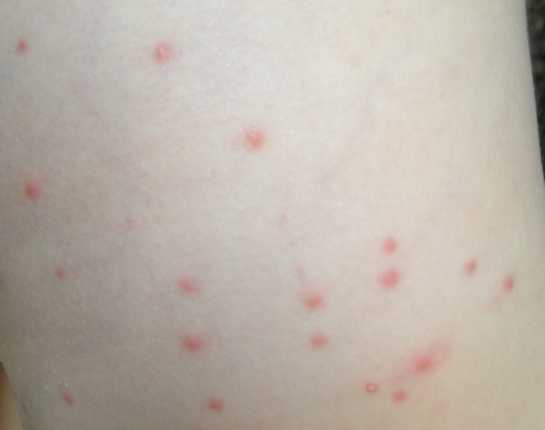 It’s a ‘worm-like’ parasite that burrows in the skin resulting in itchy spots and usually lasts 3-5 days. How not to get it! Duck itch does not occur in all lakes in Canada but can be found in lakes with ducks and plants. 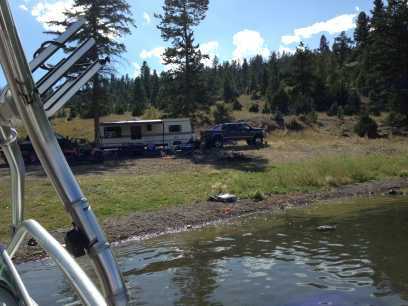 It’s normally easy to avoid by simply toweling off after swimming or having a shower, but as you can see we were not camping in an area with a toilet block. It was rather rustic. Weirdly, all of the adults had been in the same water with her and didn’t get it. I’m guessing it was because we probably toweled off, although I can’t remember and she simply dried in the sun. We were very lucky as she didn’t suffer from too much itching nor required taping oven gloves to her hands to stop her scratching. In Canada, I purchased Children’s Benylin, I’m not sure what the UK equivalent is so check with the pharmacist. According to the instructions we were able to give her a dose every four hours but please do check. When she had a bath we added a tablespoon of baking soda, which seemed to have a soothing affect. 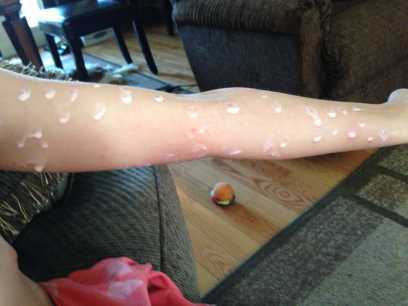 If she started itching I applied calamine lotion, as you can see I used a cotton bud, which was very time consuming, but have now learned that you can actually smear it all over. Try to persuade them to wear loose fitting clothing. Madame is wearing a Ladybird T-Shirt and Denim Chambray Playsuit from Littlewoods. Thanks to all of this the pesky little buggers didn’t ruin our holiday. Disclosure: The playsuit was compliments of Littlewoods.